With New Jersey’s legislature weighing new tax hikes during budget season, the New Jersey Business & Industry Association released an analysis today that finds the Garden State already ranked last in the region for business climate competitiveness. NJBIA tracked six individual business costs—minimum wage rate, top income tax rate, top corporate tax rate, sales tax rate, property taxes as a percentage of home value, and the top unemployment tax rate – and compared New Jersey’s rates with those of Connecticut, Delaware, Maryland, Massachusetts, New York and Pennsylvania. Applying a scoring system to the most and least competitive regional rates, New Jersey finished last of the seven states by a considerable margin. 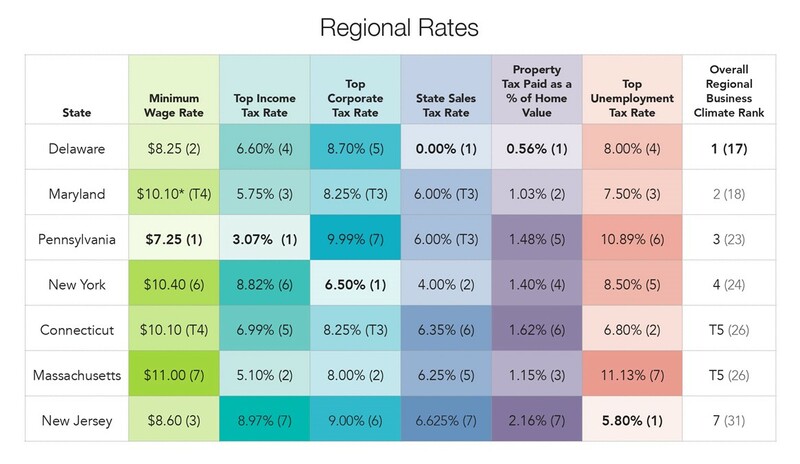 New Jersey currently ranks last out of all states in the region in top income tax rate (8.97 percent), sales tax rate (6.625 percent) and property tax paid as a percentage of home value (2.16 percent). New Jersey is also sixth out of seven states in top corporate tax rate (9 percent). The Garden State has the third lowest minimum wage rate in the region at $8.60 per hour and, more positively, has the lowest top unemployment tax rate in the region of 5.8 percent. However, it’s foreseeable that New Jersey’s overall regional business climate could further decline with discussions of a minimum wage increase to $15 per hour, proposals to raise the top income tax rate for those making more than $1 million, and consideration of a Corporate Business Tax increase. These are in addition to the added costs brought on by the mandatory paid sick leave bill signed into law and the proposed sales tax increase to 7 percent. Using data compiled by NJBIA policy analyst Nicole Sandelier, NJBIA scored the regional rates from 1 (most competitive in the region) to 7 (least competitive). 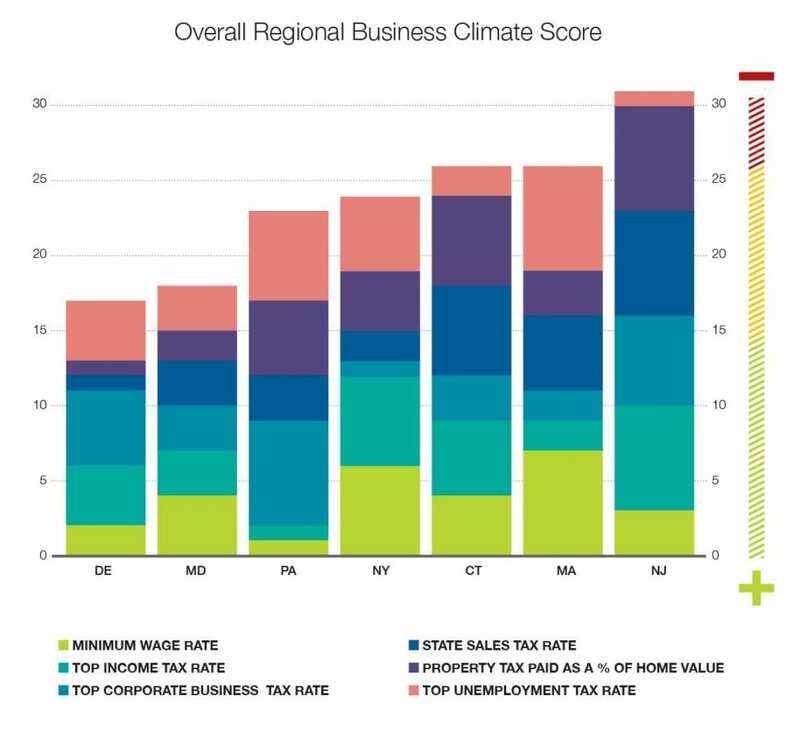 New Jersey’s cumulative regional business climate score was 31 after totaling the six rates. Delaware has the best regional score at 17, followed closely by Maryland at 20. Pennsylvania (23) and New York (24), New Jersey’s largest outmigration states, finished third and fourth, respectively. No surprises in this story…………. Let’s just re-name the state NEW VENEZUELA! New Jersey becomes more oppressive every day. It seems like they’re trying to emulate the failures of California. It can only change if the people take a stance against this form of government taxation! Highest in almost every category and we still look to increase the highest earner at a higher rate. Nothing in life is free but one can absolutely run out of other peoples money! We are looking at it now and even considering allowing currently illegal drug sales to have something else to tax! If not for the jobs here I would already be in N.C. or Fla.